..."Emily set up her own studio in the early 1990's and began a fascination with the Amazon. This two CD reflects this interest - one is a collection of her own subtle compositions, while the second is a soundtrack for the dawn-to-dusk daily life of a South American Indian tribe. Deep, fascinating and unique"
"Into the Amazon" is an atmospheric and emotive soundtrack depicting dawn to dusk of daily life in a Xavante Indian village in Brazil. At the core of the Xavante culture is the daily practice of singing and the lyrics of a song is derived from the ‘dreamtime’. There is an adolescent choir in "Adolescents" and a woman sings by the river in "Agosta’s Anthem". The whole village sings in "Proclamation" and prays in "Atsawidi Maria" and in "Rain Man Sings"the chief chants accompanied by his rattle celebrating the arrival of the rain and a powerful thunderstorm ensues. In composing the music to accomapany the Xavante songs Emily drew a lot of inspiration from her personal experience of living with the tribe and takes you into a beguiling world. The story of how this production came to be - During part of the 1990’s Emily was resident in Brazil.. A performance of her first album ‘Earth Songs’ at the Earth Summit led to a chance encounter with some elderly chiefs of the Xavante tribe from the Mato Grosso of the Amazon. She accepted their invitation to visit the community and in ‘94 Emily visited the community for the first time. In 1995 she founded the registered charity ‘Indigenous People’s Cultural Support Trust’ and between 1994 and ‘98 she dedicated much time collaborating with the community and set up a small solar powered health centre and medicinal garden.The Xavante villages became, extraordinarily enough, a frequent destination for Emily. 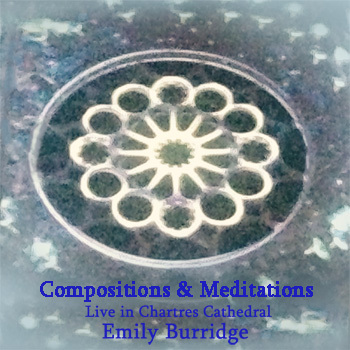 During this time Emily was invited to record many songs with both individuals and the community singing and some of these recordings are featured on this production. "Into the Amazon" is sold as a boxed double CD "Out of the Blue & Into the Amazon"